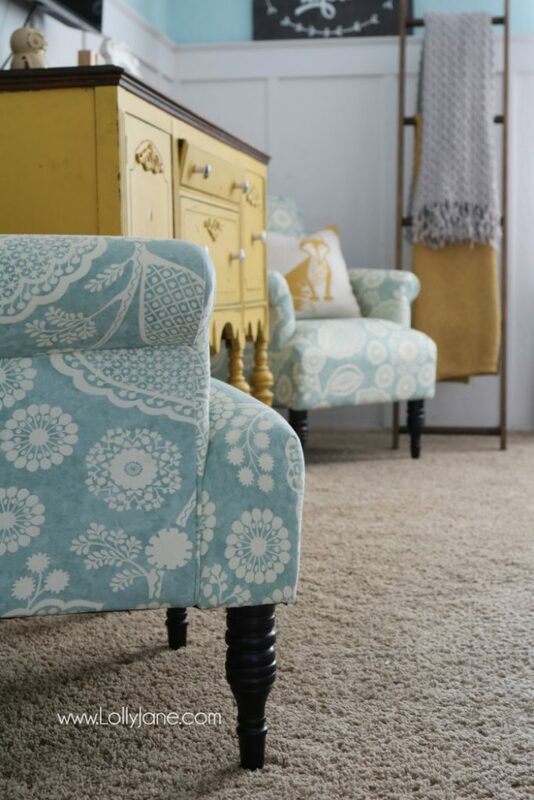 I love colors, I love the rustic farmhouse style but more than that, I just love my color! It’s a little tricky to combine the two since farmhouse tends to have stain finishes, gray or white walls, neutral decor with lots of white, white and more white. I do have board and batten white walls but couldn’t resist painting the top of the walls a warm blue, (Swimming by Sherwin-Williams). I do have a neutral furniture like my two tone coffee table and my new leather couches but if my house was on fire, the one piece of furniture I would try to save would be my mustard yellow buffet since it’s my great-grandmother’s and is over 100 years old. I’m always rearranging this poor family room and thought I would share it’s most recent update since getting our new, giant custom sectional. 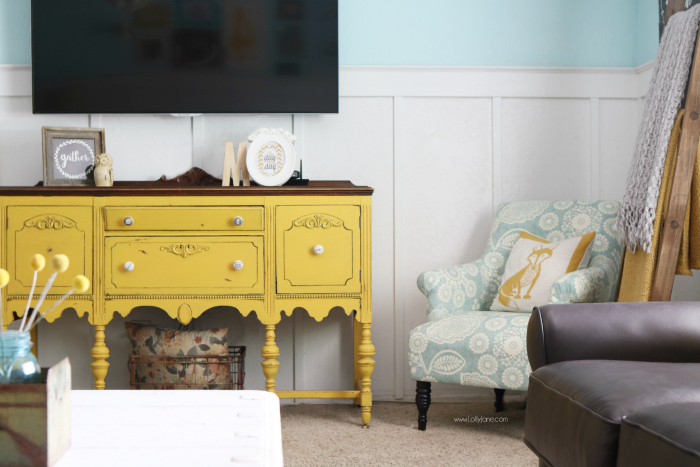 We are loving our colorful farmhouse family room, do you? 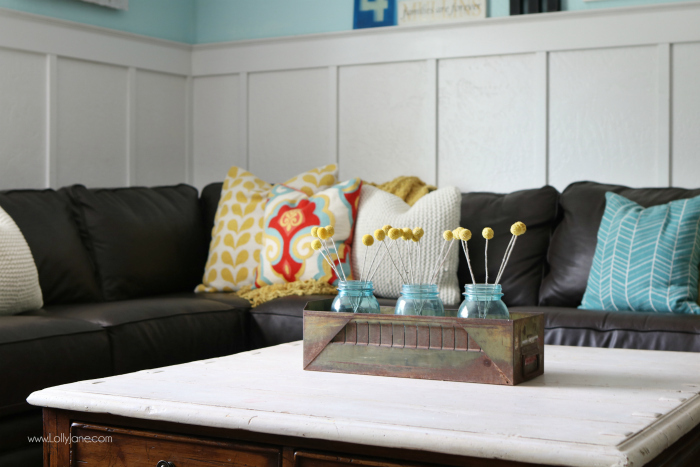 We were lucky enough to visit La-Z-Boy’s headquarters for a blogger challenge to decorate a room from scratch last year. We didn’t win, boo, BUT we did win because we got to each design a custom piece of furniture to take home as our payment for participating. 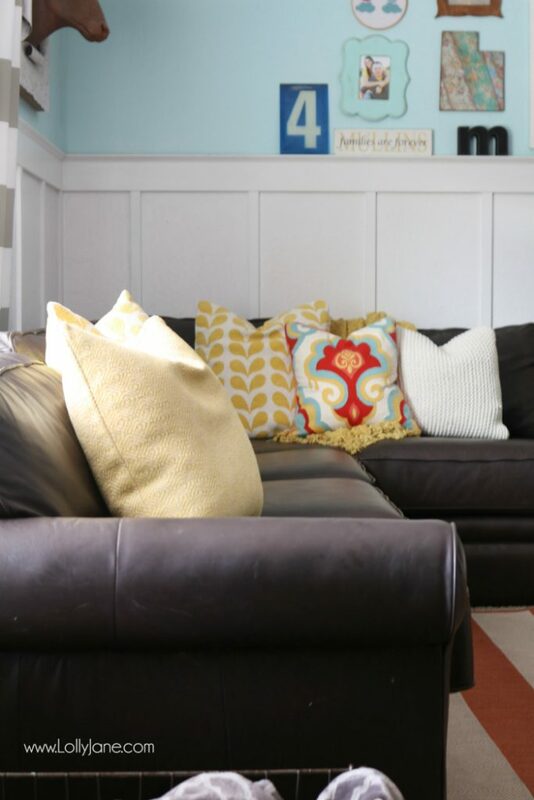 I was ecstatic to design a monster sectional that easily accommodates my family of 6. We added a queen sleeper too and enjoy it so much. It’s heavenly and has been out every week during the summer for lazy movie days or late night family time. It’s comfy and durable, a definite win-win for us! We love it! Kristi and I visited Northern Arizona in the spring to stay at the Wigwams in Winslow, Arizona. (Name that song!) We had to check out Lamell’s, an (organized) junk yard full of amazing finds! Lamell and his wife take a trailer and scour the country’s longest yard sale, bringing back goodies like that cool ammo box and vintage blue mason jars that I turned into a centerpiece. The rug is actually an outdoor rug and I’ve been pokey about finishing my back porch but it will end up out there soon, hopefully when it cools down at the end of the summer. I am a slacker! As far as the pillows…I’ve included them and the rest of the linens (and decor) in a source list at the bottom of the post. Most are from HomeGoods, it’s an easy place to shop for affordable pillows and I don’t feel bad moving them room-to-room or updating them every couple of years since they’re inexpensive enough. 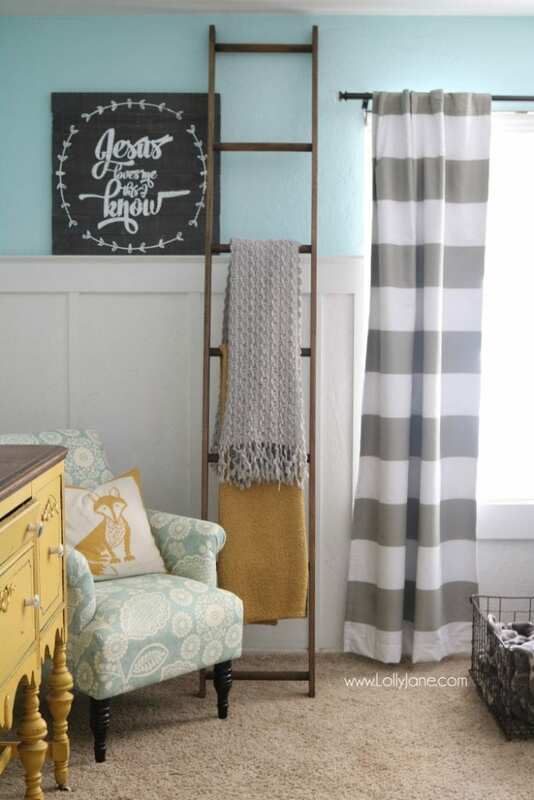 Although I never got around to blogging it, my sweet hubby made me this stained ladder for my craft room several years ago. I ended up turning it into a blanket ladder rack since I don’t access the top shelves of the craft room as much as I thought I would and use the heck out of this ladder more. My kids are constantly bundling up in them..this it the rare time you’ll see them neatly hung, ha!-they usually ball them up and shove them back on. Years ago, as a fellow law enforcement wife, I helped collect donations for a fallen officer sale. I ended up buying 2 armchairs that I had collected (scroll down a few pictures for the old ones). They lasted a good 6 years which was impressive since they were used when I nabbed them. But alas, four kids eventually wore them down and I updated them with these blue wing back chairs that were on clearance for less than $50 each. They’re smaller than I prefer for this space but I may put them in my dining room (I’ve updated the table twice since I last shared that room, wow, I am behind!) in the future if I find a good deal on replacements. I do love the fun pattern however! 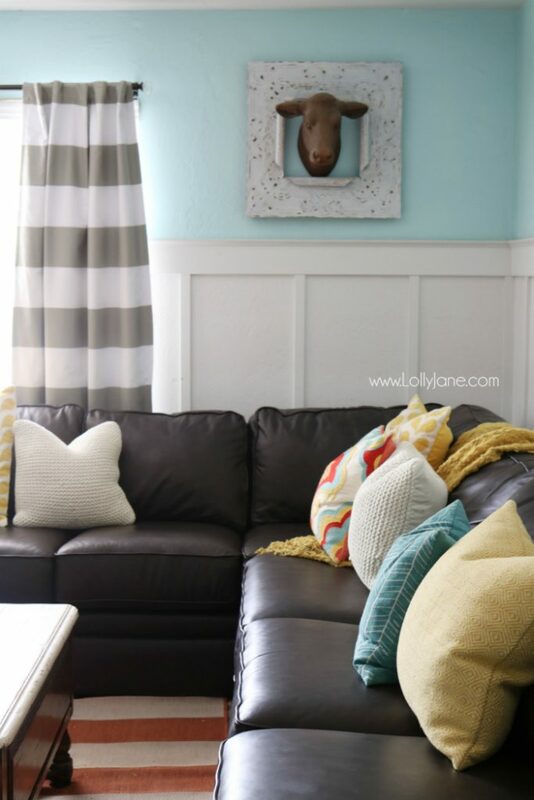 and more family room decor ideas with our old layout (the couch below was moved to the playroom since we needed a bigger one) and our white table was moved to the front porch. 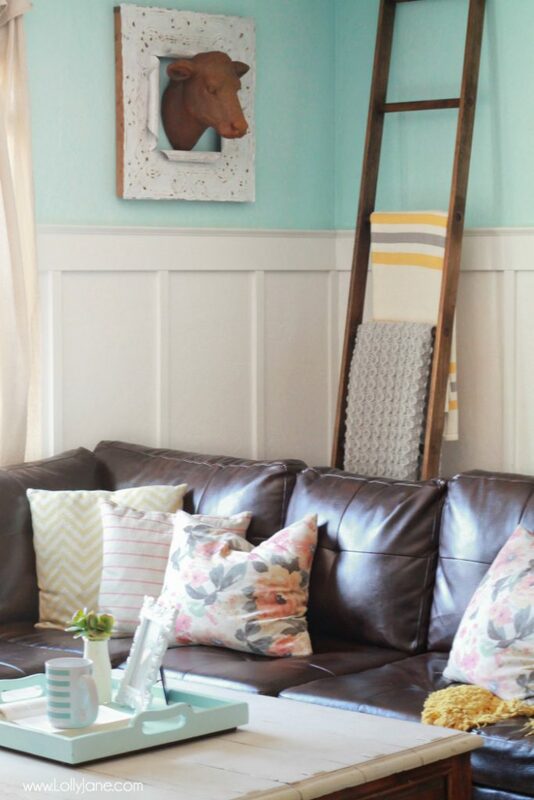 plus even more Farmhouse Style Family Room ideas. Let me know if you have any questions! 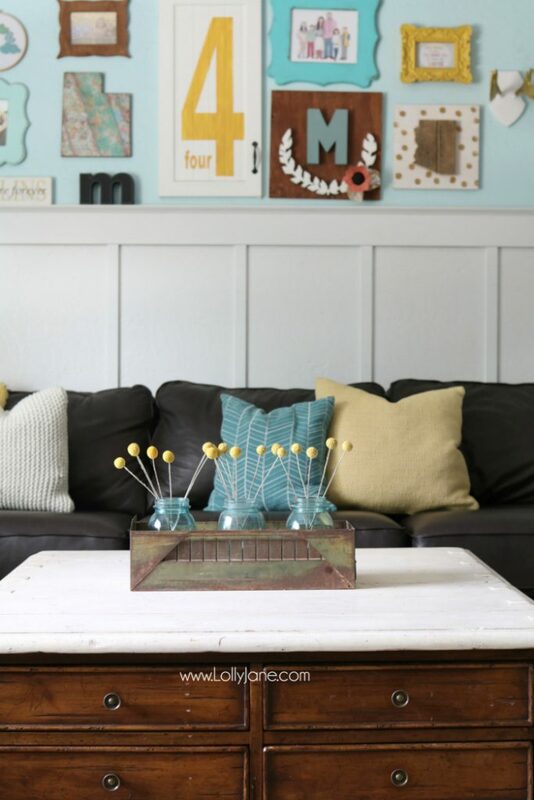 I’d love to hear what YOUR family room style is?? 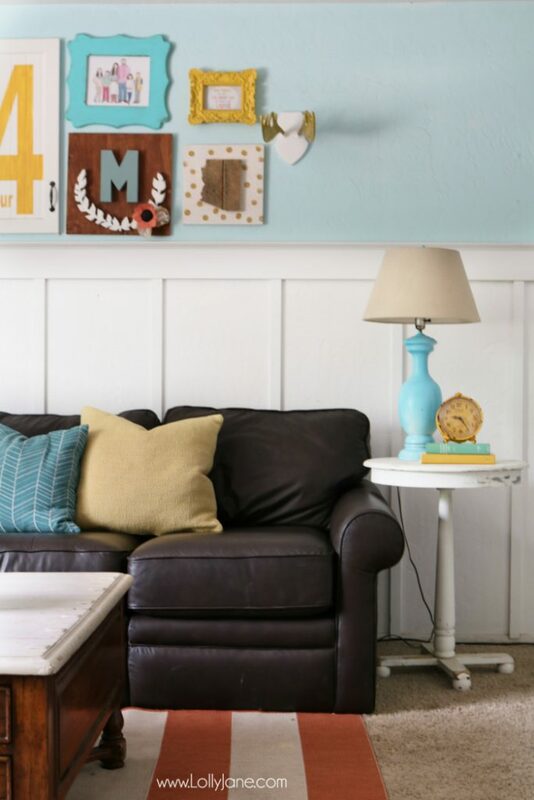 Love your color accents! I am in the same situation – love my color, especially turquoise. I ended up painting all my walls a light grey, with white trim, and grey carpet (grey plank tiles in the bathroom and kitchen). With the neutral background, I was free to add touches of turquoise and coral to each room, in varying shades and amounts. 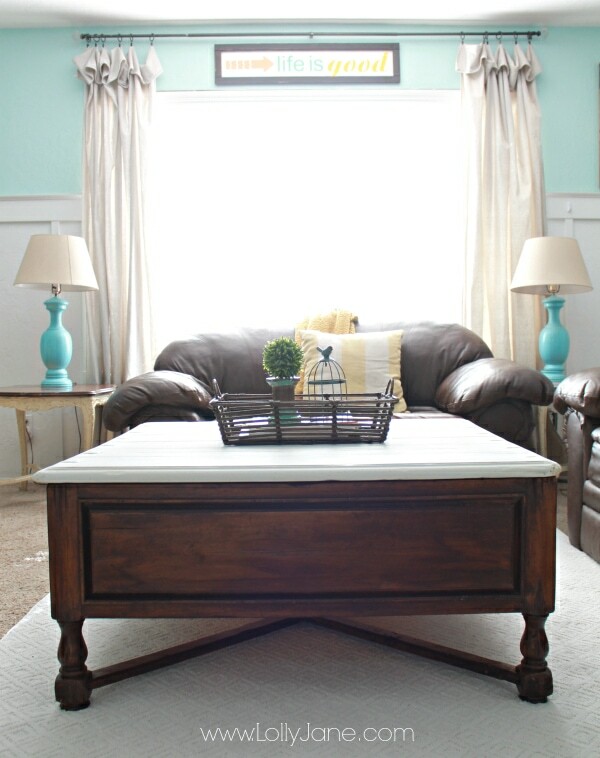 I added planks to the top of my entertainment center, and stained them turquoise. Pillows, wall decor, etc. are all free to be neutral, distressed, or colorful. I love how it turned out. Wow!! That sounds amazing!! I’m glad I’m not the only one struggling with color vs neutral, lol!! Thanks for sharing, Dyan! hey girl love the room! So cool! Love it!!! It’s so inviting, relaxing, and colorful. Love it!!! !